A blog designed to provide an outlet for Jeff's and other unvarnished opinions on community financial institutions. Sometimes serious, other times not, Jeff's opinions are his own and may not represent the opinions of his esteemed employer. I had a very interesting conversation with a bank client today. He called me to discuss, among other things, his bank's expansion strategy. During the discussion, I mentioned that I had recently driven by one of his branches and that it was the biggest in town. What he said about it inspired this post. Being the biggest branch in town, in terms of square footage, is not something cheered among industry pundits these days. Indeed, if I were to summarize the sentiment, it would be that future branches would be much smaller, but with big a** signs. Those were another bank consultant's words, not mine. This CEO isn't buying it. He said that since that branch underwent a $1.5 million renovation, its deposits grew by 40%. In prior years its deposit totals had remained in a relatively tight band. He opined that it is "amazing what visibility, access, and egress" does for a branch. He also said that his business owner customers demanded a nearby branch. But he did not think the branch had to be in the same town as the business. The next town over would due. Now that makes sense to me. 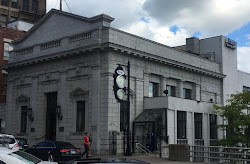 If it costs, on average, $600,000 per year in operating expenses to run a standard branch, wouldn't it make sense to build a large, marquis-type branch in every other town that cost $800,000 per year? By abandoning the every town strategy, you effectively save $400,000 per year. I looked at a few banks that I know that do very well with their branch networks but were not clients so I can opine based on public data and not inside knowledge. 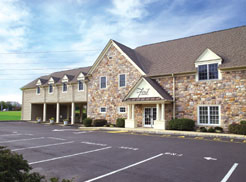 One such bank, First National Bank & Trust of Newtown (PA), had a similar branch as my client's (see photo). This is FNB&T's New Hope office. It is two towns, or nine miles, from the nearest office. The New Hope office is an end cap to a very nice strip mall that has excellent traffic patterns and easy access. According to FDIC data, the branch grew from $41 million in deposits at June 30, 2007, to $70 million at June 30, 2012, a 70% increase. Lest you think that price promotions drove their growth, this bank's time deposits as a percent of total deposits declined during that time. Oh, and time deposits/total deposits is currently 18%. So, even though I can't tell the exact deposit composition of the New Hope branch from public data, I would doubt that CD's drove this branch's growth. It is not in FNB&T's DNA. Before we jump hard onto the mobile is king bandwagon, perhaps we should pause to think about what my client told me today. It only took 10 minutes of non-scientific perusing to find another bank's branch to validate his strategy. Perhaps, then, the branch is not dead. Is there a case for bank branches? Sure. The case is different today then it was yesterday. I am familiar with your unmentioned client and his bank. He makes a great point in his strategy. The most important for a community bank is location. Your client has his branch in a great location. Not to mention there are only 2 other big banks in his area of the large branch. Most of the customer base are escaping from the large banks down the road from his. Most customers are coming back to the community bank now in days. His big branch is in the right place for it. Great strategy!!! I think fear of expending millions on a marquis branch, plus the value of deposits being at an all time low, bank liquidity at an all time high, and branch traffic on a negative trend, favors the smaller branch or branchless distribution strategy. But their are competing strategies with successful outcomes out there. I only alluded to two such strategies here. Are there more? - What was the growth of revenues? - What was the growth of net income? - What was the increase of number of products per households? How much improvement was realized in wallet-share? Spending millions on branch rehabilitation? First convince your CFO that the branch can generate a positive ROI (we won't even ask the ROI to exceed Cost of Equity (COE)). My bet is that most Community Banks cannot break-even on their Branch expenditures. I agree with your bullet points. Bullet 3 is probably a subset of 1 & 2. How do you grow revenues and net income... increase products per household/wallet share, etc. Fortunately, we don't have to bet. My company measures the profitability of hundreds of community bank branches. On average, branches have a direct pre-tax profit (as a percent of deposit balances) of 0.94%. This is in an unprecedented low interest rate environment so the credit given for deposit balances are very low. Apply that to our $70 million branch above, this generates a PTP of $658,000. Assuming our $3 million investment, that would be an ROI of 21.93%. If you assume a 7% leverage ratio, or $4.9 million of equity allocated to the branch, that would be a 13.43% ROE. To quote a wise man. Size doesn't matter, it's what you do with it that does. Deposit growth is almost a self fulfilling prophecy these days as customers have very few options in this low interest rate environment. Banks must have a multi channel distribution model to be successful. Albeit, clients still in this day want to know where there branch is they also want mobile and internet based delivery channels. The trifecta in access points. So while investing $1.5MM in a branch renovation is impressive (some may say crazy) my hope is that they also spent an equal amount on the other channels. As rates improve the deposit mix will again shift to CD's, off-balance sheet sweeps, and basic investment (either in businesses or individual). Banks must be cognizant of the fact that the balloon of deposits will at one point pop and return to a more normal allocation. Let's not lull ourselves into thinking that these levels will remain long term. Nice job on the blog Jeff. The average size of a money market deposit account increased from $70k to $95k 2008-present, so I agree with your point that money will flow to either CD's or out of the bank when rates rise. Our clients are preparing for this eventuality by remaining highly liquid by historical standards. But a case can be made to keep what once was $7T in money market mutual funds in banks instead, don't ya think? A Bank Analyst Makes Recommendations. I Make a List. For Financial Institutions, Is There Such A Thing As Too Much Capital? Yes. Yes There Is. For Financial Institutions, What Drives Value? Jeff started his banking career in the IT Department of a northeast regional bank in 1985. His banking experience includes IT, Trust, branch management, and merger integration. He has served as a consultant to the banking industry since 1997, specializing in strategy development, M&A, and profitability. He interrupted his banking career to serve in the U.S. Navy, the best Navy in the world, where he specialized in intelligence gathering against very bad people. He lives in Lancaster County, Pennsylvania with his wife and two children.